The crisis in Kenya poses an enormous challenge to the United States, not least because it has already triggered the killing of over 1000 Kenyans and displaced hundreds of thousands. Kenya has experienced violence in the wake of every election in its modern history, and though the recent violence is unprecedented, its roots extend well beyond the feud between Mwai Kibaki’s Party of National Unity, or PNU, and Raila Odinga’s Orange Democratic Movement, or ODM. While the level of violence in the wake of December elections caught many off-guard, it is a not entirely surprising manifestation of intertwined political, economic, and ethnic divisions that have gone untended for decades. Significantly, a crisis that began as one between two political parties has now expanded to include conflict between political constituencies, between ethnic communities, and between economic classes. At the same time, the post election violence has also laid bare a deeper constitutional crisis and the weakness of Kenya’s core institutions. Meanwhile, the political crisis unfolding in Kenya means that another country is added to an arc of instability that stretches from Somalia through Kenya to Sudan and Chad, and means that East Africa and the Horn have lost—for now—a country that has for decades provided a stable economic and political anchor for an increasingly turbulent region. Kenya’s crisis portends increased suffering for Kenya’s people and also undermines the potential for progress elsewhere in the region. Experts believe that the national economy has already lost close to $1 billion. Economic disruptions in Kenya are registering a ripple effect across the region, with Southern Sudan, Uganda, the Congo, Rwanda, and Burundi all suffering fuel shortages as a result. U.N. and other humanitarian operations are similarly constrained by transport blockages caused by the spreading violence. Kenya, after all, is a hub. It is the staging ground for emergency relief operations into Somalia and Southern Sudan; its port provides trade access for its land-locked neighbors; and its economy serves import and export markets in the Horn, Central Africa and to the south. 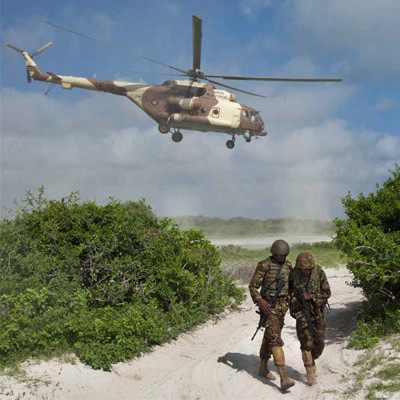 Kenya is also a longtime ally of the United States and has for decades provided landing, staging, and overflight rights for military operations in Somalia and in the Middle East. More recently Kenya has emerged as an active partner in the Bush administration’s global counterterrorism efforts. Its continued instability threatens humanitarian operations, disrupts regional economic development, and, to its external allies, poses a considerable security challenge. There is no doubt that Kenya’s decline bodes ill for the region and for the whole of Africa. But even as the specter of Rwanda is being invoked by some observers and the chaos of Somalia by others, Kenya has unique advantages that are not as readily available to policymakers working the crises in Sudan, Chad, or Somalia. First, Kenya has one of Africa’s most developed, extensive, and sophisticated civil society sectors, comprised of a robust network of religious institutions, a host of secular NGOs with strong ties to their communities, effective advocacy organizations focused on human and political rights, service organizations with effective reach, and visible and credible leaders. While some of these are constrained by the violence or by political intimidation, and others may have been compromised by taking sides in the conflict, the community as a whole provides a vehicle for peace-building, economic recovery, and political reconciliation independent of either the government’s Party of National Unity or the Orange Democratic Movement. Second, Kenya has a relatively strong economy, built by and benefitting not only an elite economic class but also an emerging middle class. While the private sector is skewed toward those businesses having ethnic and/or political ties to Kenya’s power structure, the business class has something in common that can trump ethnic allegiances—the pursuit of profit. With the economy already having suffered major blows that are being felt across political, class, and ethnic divides, the private sector may have the potential to transcend political and ethnic divisions in pursuit of a common economic goal. Third, Kenya has a professional media spanning print, radio, internet, and broadcast capabilities, and thus considerable “communications reach” —this means that there exists the potential to counter hate propaganda and misinformation, and to push out positive messages and commentary. Kenya also maintains an extensive international media presence, thus allowing reporters to keep the world informed of events on the ground and to keep up the pressure on the international community for an appropriate response. Fourth, although Kenya suffers from extensive political and economic corruption, its institutions are comparatively strong—its armed forces, for example, are professionally trained and have not, historically, evidenced a pattern of violating their constitutional mandates. And while the high courts are not widely viewed as independent, an active and developed judiciary has contributed to a culture that supports the concept—if not always the practice—of the peaceful resolution of disputes. None of this is to suggest that resolving the political crisis, reversing the dangerous spiral of targeted violence, or securing justice and accountability will be easy. It does mean, however, that resolution can be pursued at multiple levels and draw heavily on Kenya’s own strengths and resources. The first challenge for policymakers is to frame the crisis correctly. Given the ongoing slow genocide in Darfur and the echoes of the 1994 genocide in Rwanda, the spike in ethnic tensions and targeted killings in Kenya have triggered alarm and caused many to zero in on the ethnic nature of the conflict. While there may be dangerous ethnic overtones, however, Kenya’s crisis is inherently political. Both its roots and its manifestation have political, economic, and, indeed, ethnic dimensions, but the present conflict is not being driven primarily by the desire of one ethnic group to eliminate another; it is being fuelled by a volatile mix of political tension and longstanding grievances. While there is a risk that ethnicity could become a primary driver, the immediate challenge is to resolve the political crisis before it gives rise to conditions that could lead to either further destabilization or outright ethnic conflict or cleansing. The second challenge, and indeed opportunity, is to pursue a policy that builds on Kenya’s own societal and institutional strengths. Kenya’s civil society is organized and active, and is even now working to hold political leaders accountable while encouraging the citizenry to avoid violence. Third, a “3P” strategy is needed to ensure that all efforts are made to promote peace, to ensure that civilians are afforded protection from the violence, and to guarantee that the perpetrators of the violence are held accountable. The 3P strategy must be calibrated and designed to respond to current conditions and to take action in the face of positive or negative developments. A viable peace process must therefore be driven by multidimensional negotiations that address the immediate challenge—the post election dispute—while also focusing on the underlying contradictions that have given rise to this spiraling crisis. At the same time, negotiations must be buttressed by a parallel process of resolution and reconciliation within civil society and supported by an economic development strategy that can deliver a tangible peace dividend. Sadly, the failure of the two parties to reach agreement has caused former U.N. Secretary General Kofi Annan to suspend negotiations. Importantly, however, the process should not be abandoned. Before the suspension, the negotiating team, led by former U.N. Secretary General Kofi Annan and also including former Tanzanian President Benjamin Mkapa, Graca Machel, and the early involvement of Archbishop Desmond Tutu, secured agreement on a framework for ongoing political negotiations between the PNU and ODM. Importantly, that framework includes the proximate cause of the crisis—the disputed December 27 election—as well as the underlying political conflict. The United States should lend its strong diplomatic and public support to this ongoing process for as long as the process remains viable and engages the key actors while maintaining the confidence of Kenya’s people. But supporting Annan’s efforts will take more than a stopover by the Secretary of State during President Bush’s trip to Africa. The United States should also be prepared to act on both pressures and incentives that can move the negotiating process forward and consolidate progress when it is achieved. On the pressure side of the ledger, targeted asset freezes and travel bans are likely to have the greatest effect on the parties. Cutting off assistance, however, should be carefully considered. Direct aid to the government falls within the bounds of legitimate pressure, but the bulk of U.S. aid to Kenya—which totals over $700 million per year—supports HIV/AIDS programs, the provision of food aid, and small scale development and governance programs. Suspending these programs would not have a meaningful impact on the parties to the conflict, but would have an adverse effect on Kenya’s citizens. The United States and other donors can provide an incentive for a deal by using development assistance wisely. The United States should consider, for example, offering an assistance package that targets some of the economic inequities that are fueling the crisis by providing funds for housing, job creation, small business support, and financing instruments and in-kind assistance for recovery. The package could be conditioned in one of two ways—it could either be delivered on the basis of tangible progress in the political negotiations or provided to those sub-regions where local leaders work together to stop the violence and promote peace. Putting this package together, however, will require the Bush administration to work with Congress to free up the necessary resources. Currently, the United States provides Kenya with a robust aid package, but little money is presently available for economic development because the bulk of our assistance goes to HIV/AIDS and food aid programs. The United States should also engage and support sectors of Kenyan society that can both promote resolution and ensure the viability of a peace agreement over the long term. Specifically, this means leveraging the influence of the business community and supporting Kenya’s civil society groups, which are already actively engaged in local and national efforts to bring the crisis to a peaceful end. Additionally, it requires supporting Kenya’s traditional and community leaders. “Support” means two things: First it means providing resources to support a growing number of constructive initiatives being undertaken by Kenyans themselves. Second, it means ensuring that the Kenyan people are participants in, rather than observers of, any longstanding political agreements that may be reached. The international response to protection must be calibrated so that it addresses current conditions and lays the ground for a rapid response if and when the crisis escalates. If the crisis in Darfur (where a U.N./AU peacekeeping force has yet to fully deploy, more than six months after its authorization) has taught the world’s policymakers anything, it is that rapid response requires advance contingency planning. At the most robust end of the spectrum, there may be a need for a military protection force that can secure transportation access and networks for humanitarian operations and offer safe havens or other means of civilian protection. Ideally, this role would be undertaken by the Kenyan police and/or military forces, but until they are able to demonstrate sufficient independence and competence, other options must be considered. Although the ebbs and flows of the crisis make it difficult to plan such an operation and many may argue that it is premature, contingency planning by the U.N. and AU and with input from Kenyans and strong international support should be undertaken promptly so that a force can be rapidly established and deployed swiftly if needed. While numerous institutional vehicles—the United Nations, the African Union, or the regional organization IGAD—could provide the umbrella for a rapid deployment if needed, it is important that advance and contingency planning include consultation with and coordination between all of these organizations. Even though the involvement of U.S. troops would likely provoke controversy, the United States should—in consultation with regional partners and the AU, its European allies and the UN—explore what U.S. military forces based in Kenya and Djibouti can provide. This is not to suggest that U.S. troops should be deployed to provide protection; it does mean that U.S. military assets in the region should be considered in order to determine whether logistical, supply or other components can be brought to bear and whether, in the event of a dramatic escalation of the crisis, the U.S. military presence can be used effectively and without complication. Similarly, the Kenyan police cannot be ruled out of the solutions, even though significant challenges to their involvement must be taken into account. The Kenyan police forces are professionally trained, but they have a long track record of corruption and are prone to political capture by the government of the day. In this particular crisis, their response has been uneven and their priorities unclear. While their involvement therefore may not prove the most viable option, the volatility of the crisis demands that all possible options be explored, including the use of local forces. Planning should still take into account the need for safeguards, a transparent command structure, and measures to prevent government interference. An international, AU, or local force may not yet be required, but planning for all of these options must begin immediately so that a rapid response can be undertaken without delay if and when it is necessary. At the same time, other protection measures can be put in place now. In areas as yet unaffected by the violence or where the violence has decreased sufficiently, the international community should explore the options for the deployment of unarmed human rights monitors, possibly comprised of international and Kenyan members. Across Kenya, immediate effort should be made to utilize radio communications to alert communities to incidents or the spread of violence and attacks, provide information on the availability of safe areas, and counter the hate propaganda that is fueling individual attacks. Finally, effort should be made to negotiate safe passage agreements supported and publicly advocated by Kenya’s political leaders. While these agreements may not afford comprehensive protection, they can ensure that, for example, relief assistance and HIV/AIDS drugs can be distributed to the displaced and those who cannot leave their communities, and they could also build confidence. Accountability—for both the election violence and for the failure to protect Kenya’s citizenry from it—is critical on two fronts. First, justice for the victims of the violence is a cornerstone of any long-term resolution to the crisis. The perpetrators of organized atrocities targeted against specific ethnic or political groups must be held accountable to satisfy victims’ demand for justice and to deter future crimes. Second, the international community must use appropriate accountability measures to influence the calculations of the opposing political factions. Given the role that corruption has played in the build up to and during this crisis, transparency must be a core principle. Kenya’s high courts cannot provide the vehicle for either resolving the election dispute or dispensing justice in the wake of mass killings because their members are appointed by the president and subject to considerable executive branch influence. There are, however, options for a domestic approach to securing justice. Kenya has seen violence before, and both existing consultative processes and the documented experience of past attempts at accountability should be taken into account as a first priority. Kenya also has the social infrastructure needed to promote community dialogue—facilitated by traditional leaders, elders, NGOs, or religious figures—that, if maintained, could also lay the foundation for justice. Kofi Annan, meanwhile, has called for the creation of a Truth and Reconciliation Commission which—if independent enough to earn the confidence of Kenya’s citizenry and led by a credible moral leader—could provide a powerful vehicle for both accountability and reconciliation. International instruments may also be needed to ensure that justice is served. The U.N. Security Council could, for example, consider referring specific cases to the International Criminal Court and/or call upon the ICC Prosecutor to initiate an investigation and collect information that could lead to indictments. Accountability can also be shaped by external pressure, and here both African and international institutions have options that can be brought to bear as and if needed. The African Union could, for example, choose to suspend Kenya’s membership; the UNSC could consider targeted sanctions; bilateral donors could opt for Kenya’s suspension from critical programs, trade, or other benefits. If these or other pressures are invoked, it is important to combine them with incentives so that the parties to the conflict are offered a clear choice, and to ensure that civilians are spared the impact.